A conversation with Alexis Joseph, MS, RD, LD, founder of the popular food blog Hummusapien and co-founder of Alchemy, on continually learning and exploring your own meaningful path to health and happiness. Monica: Thank you so much for taking the time to share your journey! What first influenced or motivated you to go into the health and wellness world? Alexis: I took an incredible trip to Israel in June of 2011 that changed my life in a number of ways. That experience is what first ignited my interest in plant-based nutrition and encouraged me to consider studying nutrition (dietetics) in school. I’ve always known three things: that I loved to write, that I wanted to help people, and that I wanted to make an impact doing both those things through the lens of food. My interest in nutrition came last, but it brought my passions together as one and resulted in me writing my first blog post in August of 2011. Monica: Sounds like it was such a life-changing trip! How did that experience inspire you to want to help others in their health? Alexis: My desire to help people in my career began with the mantra of reversing chronic disease through plant-based nutrition. I was enthralled with the research surrounding this paradigm, and it’s what fueled everything I did to grow my blog Hummusapien. I thought if I could teach people to make delicious food with personality that happened to be wholesome, I could make everyone a little happier and less susceptible to chronic disease. But in 2016, I realized my passion for health was verging on an eating disorder. I confessed to the world that I, as a “healthy living blogger,” was contributing to an epidemic that was systemically fostering orthorexia in an online space that desperately needed less perfection and more vulnerability. There’s a very fine line between being healthy, and being unhealthily obsessed in a way that limits all over facets of life. Whether I’m developing a new restaurant concept, partnering with a brand, or helping a client work on her relationship with food, my hope is that I can bring a bit more joy back to the table. Monica: It’s so important to take a look back at your actions, and re-evaluate if it’s actually making the impact that you want. How has your definition of health and happiness changed through that experience? Alexis: If you asked what health meant to pre-2016, I’d probably talk your ear off about antioxidants. Those are definitely important, but they’re not everything. My work now has helped me create a fulfilling life that has room for error, but still puts experiences and people first who truly light me up inside. I’ve learned first and foremost that health and happiness is defined differently for everyone. To me, having health and happiness means feeling an inner sense of peace. It means moving my body in a way that serves and challenges me. It means consuming nourishing food and drink that feeds my body and soul. It means prioritizing relationships with family and friends, managing stress, and sleeping. It’s kale and cookies and everything in between. And most of all, it evolves and grows as I do. Monica: What wonderful insight on keeping both your health and life in perspective! How do you try to balance it all? Alexis: Owning a business (or two!) means work never sleeps. I’m a naturally ambitious person that thrives on productivity and accomplishing. I attribute my type A personality to where I am today, but I really try to practice what I preach and slow down to enjoy life, or else what’s the point? That means making time even when I feel like there isn’t time to be with my friends, go out to eat, be outside, read, cook just to cook, and do all the other things that bring me joy. I talk to my best friends and family multiple times a week, and I go out of my way to make plans with my friends so I can have hard stops with work. My most creative time is early in the morning, so lately I’ve been enjoying getting up at 6am, sipping coffee and working on the blog until around 8am when I make breakfast. Then I work on Alchemy stuff the rest of the day. I usually stop around 5pm or 6pm so I can work out, make dinner, and spend the night screen-free with my boyfriend. To be honest, I think balance is a fairy-tale word. What’s balanced to me might be wacky to someone else. I juggle a lot of tasks and wear many hats, but I love doing what I do. As long as I can keep feeling the heat of the fire that makes me feel alive from the inside out, I’ll feel confident, happy, and fulfilled managing all that I do. Monica: It’s so wonderful when you’re able to do what you love. How does your sense of purpose continue to drive you towards your most meaningful work? 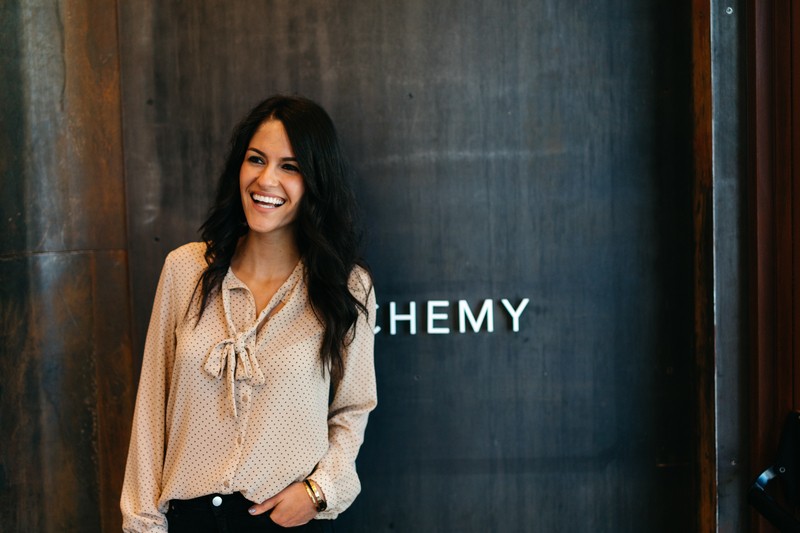 Alexis: My purpose has always been to empower others to lead a nourishing, joyful life. I’ve been on both ends of that spectrum, and I’ve found that my happy place is dancing somewhere in the middle, where I honor health but don’t have to follow rules or make sacrifices in the name of following the perfect diet. I am so grateful for the education I’ve had about health and food systems and I want to continue educating the public on what it means to have good, fair, wholesome food. I do believe that food is medicine, but it better be tasty, too! You can believe with all your heart in the power of fruits and vegetables and exercise and still enjoy a warm croissant for breakfast. Health is not one or the other. It’s inclusive. It’s living in the gray. That’s the beauty of food freedom. And the farther I can spread that message like confetti, the better. Monica: Before we go, what’s the one thing that you want others to know to help them thrive? Alexis: Look inward. Be confident and listen to your intuition. If you treat yourself with all the love and appreciation in the world, how would your actions change? Would life be different? If your body could talk, what would it say? The answers are inside, but you have to be open to quieting the noise. To learn more about Alexis, head on over to Hummusapien and Alchemy.